Hosting a crowd? Serve two big pans of homemade chicken enchiladas. No crowd? Stash one pan in the freezer for later. I posted this picture on instagram on Sunday right before I slid the enchiladas into the oven. Many of my people had requested them; so many of my people were quite pleased with Sunday dinner. Ever since I was a kid, I’ve been drawn to enchiladas. That combination of rich sauce, melting cheese, and luscious corn tortillas has always been a favorite. This batch was no different. 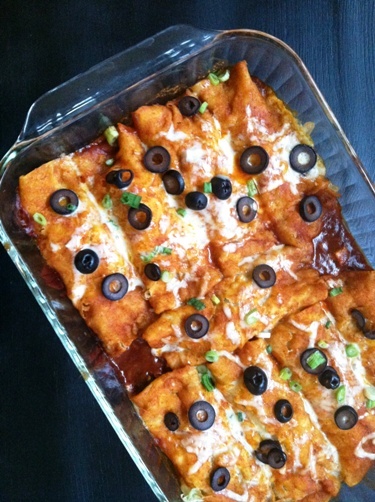 I combined several different recipes to make these Chicken and Chile Enchiladas for a Crowd. I say “crowd” because most people aren’t feeding 8 people every night. Know this makes a bulk batch. Either feed a lot of people or stash one pan in the freezer for dinner on another night. One of the beauties of enchiladas is that you can prep them in the cool of the morning and stash them in the fridge until dinnertime. They only take about 15 to 20 minutes to heat in the oven, so you don’t have to wait long, neither do you need to heat up your kitchen for hours on end. Believe it or not, my mom always made our enchiladas in the microwave. You can do that, too. Or you can even try them in the slow cooker. 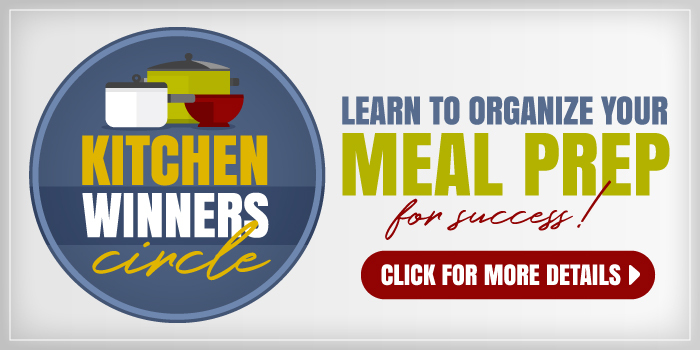 This recipe features cooked chicken and roasted chiles. Both came from my freezer. You can make them fresh the day of. Or you can plan ahead and stash cooked chicken and roasted chiles in your freezer so that this dish comes together super quick. I’ve timed myself. If all the ingredients are ready to go, I can soften and roll a dozen enchiladas and have it ready in 15 minutes. If I can, you can. 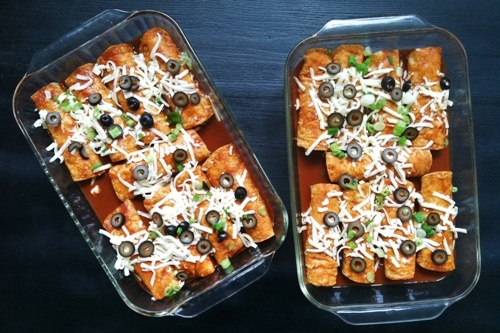 A reader recently asked about how to make enchiladas tomato-free. I have never in my life put tomatoes or any tomato products into enchiladas. I typically buy canned Las Palmas enchilada sauce which is chile-based. There is no tomato sauce in this enchilada sauce. Read your labels to find a brand with ingredients you like. I don’t love some of the oils in Las Palmas, so one of my goals this year is to learn how to make it myself. Also of note, I used home-roasted poblano chiles in this recipe. They add nice body and flavor. You could use roasted bell peppers if you want less heat. Learn how to roast pepper and chiles here. Grease two 9×13-inch pans. Preheat the oven to 350°. 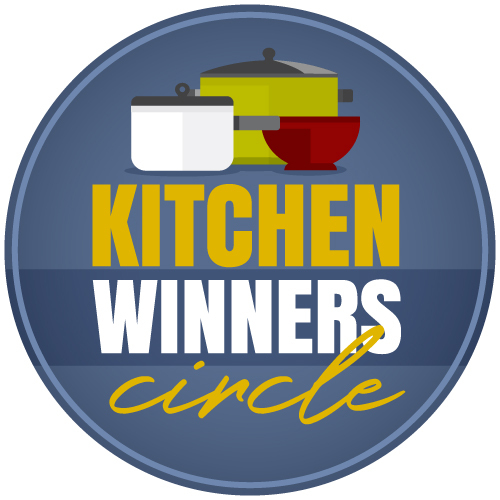 In a medium mixing bowl, combine the chicken, chiles, and 1 1/2 cups cheese. Set aside. Heat the oil in a small frying pan. Soften the tortillas in the hot oil, about ten seconds per side, until slightly leathery. Drain on paper toweling. Spread a thin layer of sauce across the bottom of the prepared pans. Drizzle sauce over the tops and sides of the enchiladas. Sprinkle the enchiladas with the cheese, olives, and scallions. Bake for 15 to 20 minutes or until the cheese melts and the sauce bubbles. * If you would like to freeze one pan, wrap, label and freeze once the enchiladas are filled and rolled. Bake as directed, adding additional cooking time if baking from frozen. Enchiladas are super tasty and can be made with all kinds of fillings. You can go meatless if you like. You can top them with all kinds of yummy goodness like salsa, guacamole, and sour cream. You can make them ahead and freeze. They are perfect for potluck suppers and to deliver a meal. 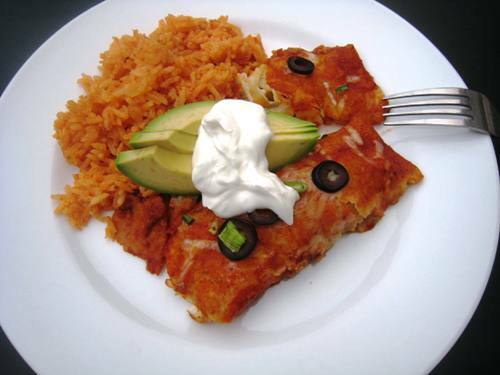 What’s YOUR favorite way with enchiladas? I have been trying to get inspired to use the shredded chicken that has been languishing in my freezer. This post did the trick. I come from the very bottom tip of Texas region, born & raised 3 miles from Mexico and how we make enchiladas is this.. Add about 1/4 cup chili powder to about half a cup of water, maybe more… and bring to a boil. and then turn the heat down low. It’ll be quite thin at this point.. Quite quickly slide your corn tortillas in the sauce & out (as fast as you can) and then add chopped onions & cheeses, roll up & place in greased baking dish… Continue to do this till all your enchiladas are done… your enchilada sauce will be super thick & you may have had to add more water to keep it on the thinner side… If you want, add garlic & a small can of green chilis here to the chili water and puree with a hand blender… or just use slightly thickened chili water, then pour over the enchiladas & bake.. True Mexican cooking us very very simple since it is truly peasant food… and delicious! My family is from Santa Fe, and we make red chile sauce starting with 3 Tbsp bacon drippings. Med high heat, add a few cloves of chopped garlic. Add 1 Tbsp flour to thicken. Let the flour cook off a bit. Add 2 Tbsp red chile powder from Chimayó, stir paste for one minute only. Burnt chile powder is noxious! then stir in about 2 C chicken broth to form a thin liquid. Then let it simmer for an hour or so. Bacon drippings are essential, garlic makes it sing. Salt to taste. There is another option without tomatoes. I make crab enchiladas with green salsa/green sauce made with cooked tomotillos. Just a thought! I sometimes mix green salsa with sour cream. Super yum! 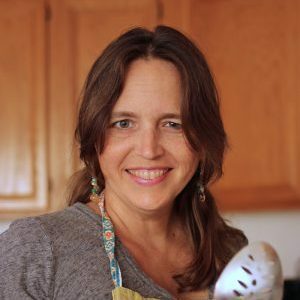 If you are still on the lookout for a good Enchilada Sauce, I recommend the Red Chile Sauce from Paleo Comfort Foods by Julie and Charles Mayfield. Its a New Mexico style sauce that involves rehydrating chiles, and cooked onion, garlic, oregano, cumin and apple cider vinegar. I made the turkey and black bean version about 6 months ago. When fresh, they were good. When frozen and later baked, the tortillas had turned to total mush. 🙁 The flavor was still good but it was really difficult to get past the texture. Any suggestions to prevent this in the future? To be fair, I used a flour tortilla instead of corn since that is what I had (package of 10 for 39 cents was hard to turn down) but in my experience, corn tortillas tend to fall apart faster than flour so I think it would still be the same scenario. I never make enchiladas with flour tortillas. It’s a personal preference, but I think flour tortillas get gummy in the sauce. I fry corn tortillas in oil until they are just bendable. That helps them hold up better in freezing. My go to enchiladas are my own easy creation: shredded cooked chicken mixed with equivalent of one can black beans not rinsed/drained(I’ve taken to making them in slow cooker and freezing 2 cups/quart-size bag instead of buying canned), salsa verde to taste(1/2 cup +), a little cumin. I fill whichever tortillas I have on hand. Spread a little enchilada sauce(I use trader joe’s) on bottom of 9×13, put rolled enchiladas in. spread more sauce over enchiladas, top with shredded mexican cheese mix(costco). Into the oven until heated through and cheese is bubbly. Oh yum! So easy. And depending on how much cheese you use, pretty darn healthy, as mexican food goes. I am not sure why flour tortillas would get gummy in the red sauce. I have been making enchiladas for 60 years and have yet have them get gummy. Interesting. That has always been my experience. Do you make them ahead of time?